Chalet La Taupiniere and its garden offer glorious views of the surrounding valley and mountains and is a wonderfully restful place. The private garden is bordered by trees and shrubs. There is a large patio with a table and benches for ‘al fresco’ eating in summer, on the terrace by the pool or under the pergola draped with Virginia creeper. The garden is ideal for barbeques, sunbathing, and relaxation. 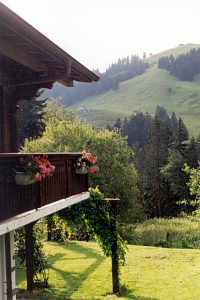 Being an alpine village, the garden is on a slope, although there are flat, level areas at the front of the chalet by the parking, and also on the terrace area by the pool. Chalet La Taupiniere is level to the quiet cul-de-sac road and has a parking area for two cars, which is level to the entrance area. This is very unusual in the village, not to have steps or a slope from the parking area to the chalet. Most noteworthy is the chalet’s superb and beautiful location. It is an ideal base for all mountain activities including skiing, mountain biking, walking, as well as golf, paragliding, tennis or just for relaxing. There is plenty to do within an hour’s drive of the chalet, more than enough to keep you amused for your holiday at La Taupiniere.